Rochelle and Dave Freiderich knew their baby was dying, and they wanted to hold her close and rock her for comfort for each other. No rocking chair was immediately available which added to their stressful situation. the Clevland Clinic Main Campus dedication in April 2010. They decided to help other parents going through the same heartbreak and to keep Eleonore’s memory alive by helping provide specially designed rocking chairs for hospitals where there were none available. It’s important to be able to hold that baby close and the comfort of a rocking chair helps. There are many hospitals where there is no rocking chair to help comfort in those last hours, so Rochelle and Dave pledged to help provide as many as possible. The Leprechauns heard the story from the Reese family who also lost an infant soon after birth. A Leprechaun Rocking chair has been ordered in memory of Rory Patrick Reese, April 1–4, 2014 which will be placed in the NICU of Fairview Hospital. Rory was the son of Brigid, a young Leprechaun mom who dressed up as one at parties that we had at area hospitals for sick children when she herself was very young. Another chair has been ordered for MetroHealth Medical Center. 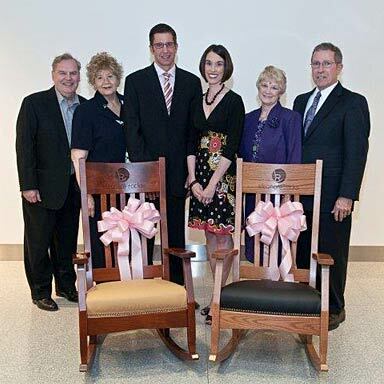 Currently the foundation has donated hundreds of rocking chairs in 11 states. They have been working with Duke University and they are expecting a shipment of rocking chairs in the next few weeks which will put them in 12 states. Eleonore’s story and the history of the foundation can be found at www.eleonorerocks.org.